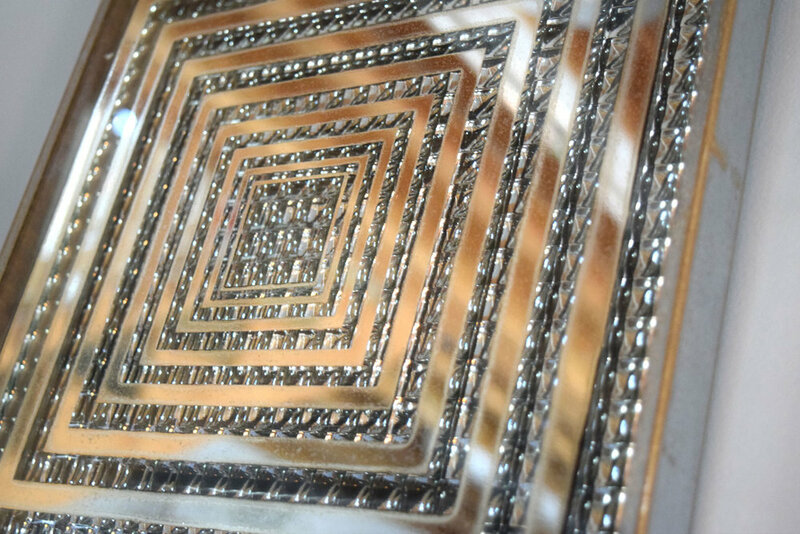 Fabulous vintage Op-Art mirrored wall hangings in the style of Hal Bienenfeld. Bold silver silkscreened pattern on the interior of the top glass over a background that is comprised of small silver "bubble" style indentations. Chrome frame. Ready to hang with the attached hangers either diagonally, or straight. Vintage condition consistent with age. Silkscreen print on the inside of the top glass shows a bit of wear around the edges of the lines. Wear to the chrome frame as shown, which could probably be removed with chrome polish. 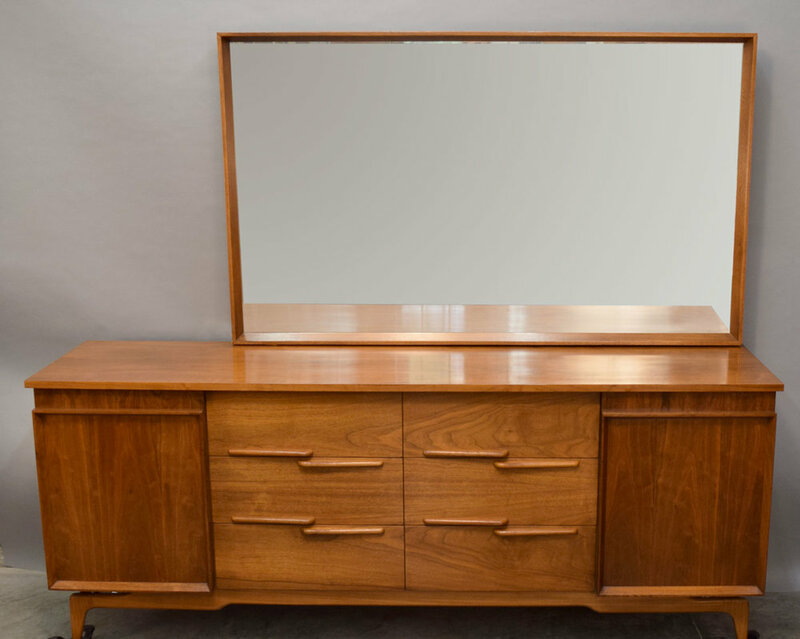 This beautiful Danish teak mirror has a wonderful presence! By collectible Danish mirror makers Pedersen & Hansen, model No. 912. Solid teak with nice joinery details. Excellent vintage condition. Wonderfully simple lines yet beautifully detailed: this is a gorgeous, large mirror designed by designed by Kipp Stewart and Stewart MacDougall for Drexel and made in 1964. Solid walnut frame and high quality mirror. This piece can either be mounted on a dresser (all hardware included) or hung on the wall. Excellent condition. 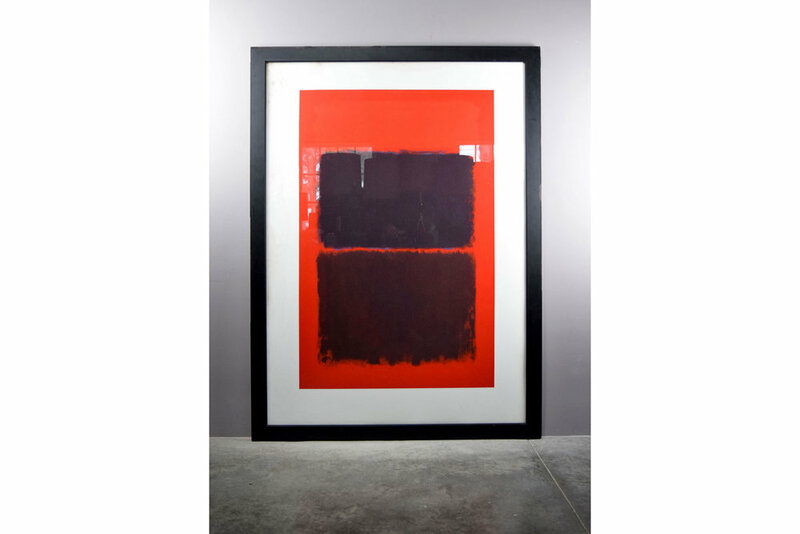 A massive, high-quality screenprint for Mark Rothko/s "Light Red over Black" 1967. Marked: Copywright Kate Rothko Prizl + Christopher Rothko - DACS LONDON 1999 - Published by King and McGraw 1999 - Screenprinted by hand in the UK at Artizan Editions"
Frame has many chips along the edge, print perimeter has some water damage stains. We would recommend adding a mat to cover. A beautiful screenprint signed "Sloane print #5 of 14. 1977". The gold-toned faluminum frame has some light wear as shown. A wonderful abstract oil painting signed "Bogush 1966". The original frame is slightly warped and there is light soil to the canvas. This is a high quality print of Matisse's blue nudes collage. In excellent condition; there is a small chip in the glass in the lower right corner. Titled "Along the Shore II". This is a gorgeous print. Textural collagraph printmaking technique includes some actual botanical pieces. Really wonderful details! Signed "M. Meissner Imp A/P"
The frame has slight edge wear and the cream mat has some slight discoloration at the top. Beautiful woodblock print by David Stearns, 1963. #8 of 9 made. There is some wear to the frame and yellowing to the mat. Beautiful color woodblock print by artist David Stearns, 1958. #7 out of 20. This is a beautiful, moody piece of art. Layered mixed media collage and watercolor, very tactile. Some loss of gilding to the frame as shown. I would probably remount the artwork in a new frame/mat. A very large framed mid-century painting by collectible mid-century listed artist 'Riggs'. Heavy impasto on canvas. Cheerful acrylic on canvas by June Van Dyke, from the estate of an Avid art collector from Newton, MA. The aluminum frame has some light wear. 24.25" x 30.25" x 1.5"
Signed modernist still life by A.C. Snelling. 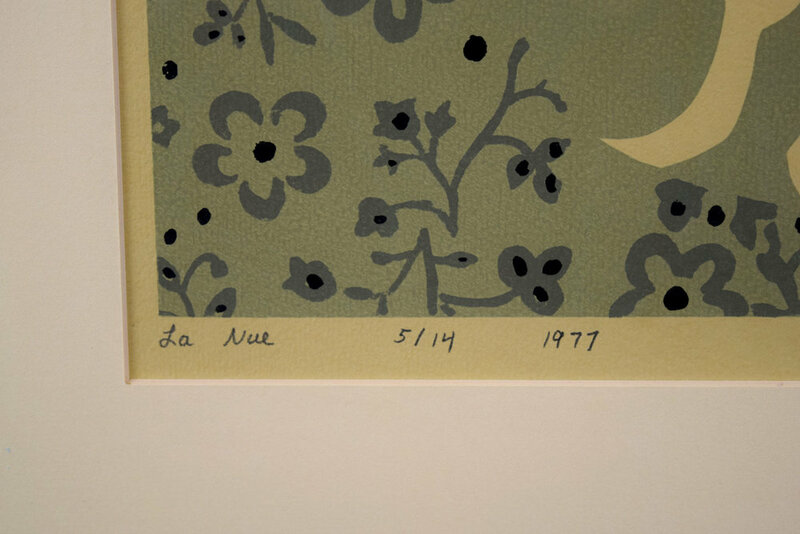 24" x 35"
We love this print collage, made by the daughter of an art history professor in high school in the early 1970s. 18.25" x 19.25"
Acrylic painting with mixed media collage by Joyce Goodman. 1968. Brass trim on the frame has some gaps at corners, otherwise very good condition. Wonderful lively impressionist oil painting on masonite board by listed artist Nino Pippa (born Italy, American.) Beautifully framed. Signed lower left. Accomplished Italian artist Nino Pippa is one of Italy's finest Twentieth Century Impressionist painters. He was born in the Island of Sardinia,Italy in 1950. He studied at the "Liceo Artistico di Cagliari". Pippa's paintings have found homes in private collections throughout the world. TeleMaxArt and Yessy Art Galleries represent the artist. Dimensions: (frame) H 23.5" x W 29.5"; (sight) H 17.5" x W 23.5"
This outstanding mirror is part of a matching bedroom set we have, but it also shines as a stand-alone piece for any room. It is very large, with an elegantly beveled, deep frame. 59.25" wide x 35.25" high x 2" deep. This mirror has wooden cleats for mounting to the matching dresser, which could be modified for wall hanging if desired. A very Scandinavian print of a reindeer and midnight sun in a whitewashed rustic frame. The frame has a couple of chips, and a wire for hanging. 7.125" x 9"